You must be a FULL SAJA member to register for voting and to run for the SAJA board. 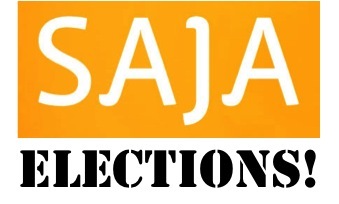 SAJA members are now invited to vote online to fill seven (7) open positions on the board. Please read each candidates' statement and vote for the 7 candidates you would like to see on the 2017 SAJA Board. Note: You must be lifetime or full member of SAJA member to vote. By voting online, you are submitting a proxy ballot. If you're not a member, please become one today, and receive special discounts for upcoming events and exclusive emails. In person voting will occur at the annual members meeting/holiday party at Pondicheri Restaurant on December 8th in NYC. Then come celebrate with use at our annual holiday party! Why do you want to join the SAJA board? To strengthen the voice of South Asian journalists, and give back to the organization that continues to shape support my career. What is your vision for SAJA 2017-2019? This will be a key time to strengthen the voices of diversity in media, and grow a network of journalists across the country. I'd like to foster the voices who aren't in main city centers, especially rural or exosuburban America, and help journalists make an impact from their communities. What role has SAJA played in your life thus far? SAJA is the reason I'm a journalist. The first journalists I met out of school were SAJA members and they played a crucial role in building a career -- whether it meant giving me the SAJAForum platform, or talking through big decisions at any given moment. SAJA is an excellent way to bring together journalists from the region, and those not from but interested in the region. However, I feel that it's focus so far has mostly been on India. I'd like to amplify SAJA's efforts to include journalists and reporting from smaller countries in the region that often receive less attention, to truly showcase the diversity of South Asia. What skills or resources do you bring to the board? -Contacts with D.C. think tankers doing research on Pakistan and South Asia who can be a great resource for professional and aspiring journalists for stories, talks, context, etc. As a South-Asian whose context is primarily India and South-Asia, I, initially, struggled to find my feet in the US journalism/work circuit. I find that SAJA has been able to facilitate that much-needed platform for immigrant journalists, like me and those interested in the South-Asian region, to find that grounding amongst people from similar backgrounds and be able to practice journalism that resonates with them. It was very important for me to connect with SAJA members who have made me feel welcome in a new country. Very simply put, I’d like to join the SAJA board to be able to pay it forward. I am also seeking to better understand the South-Asian diaspora and I hope that the SAJA board will give me that opportunity. I see SAJA as a support and training group for journalists. I would also love to explore more advocacy avenues for the practice of journalism relating to South Asia. Even more so, with reporting, world over, becoming more insular and shrinking budgets of newsrooms, SAJA could play an important role in encouraging newsrooms to looking beyond borders (and oceans!). Hard investigative pieces, for one, are good bait for any news organization. Following the work of SAJA journalists and the wide range of events have certainly enriched my, still developing, understanding of a polylithic South-Asian diaspora. I’ve also found friends here whom I cherish and connect with on a deeper level. SAJA has nursed a strong need in me to be a part of a community, both professional and cultural. Over the next few years, journalism will be more important than ever before, and it's imperative that the industry reflect the underlying diversity of America. As a professional organization connecting South Asian journalists, SAJA can play a leading role in providing both access to opportunity to young people of color and making the media more representative. We can also connect better with our communities and make sure their voices are heard. We can also reorient journalism towards its original activist mission of holding power accountable and ensuring transparency and access to information in a world focused on clicks and engagement. SAJA has helped provide me a community of journalists to call my friends and bounce ideas off of. My journalist friendships that I made through SAJA have also been invaluable in supporting and encouraging the growth and development of Muslim Writers Collective over the past few years. What is one SAJA event or activity you would like to implement? I would love it if SAJA could partner with high school and college students and pair them with industry mentors to work in local investigative journalism stories. Doing is the best way of learning and there's a huge pool of talent out there that we need to reach out to and inspire about the potential of journalism to effect meaningful change and convince them that they can play a role in this process. Currently exploring board opportunities that will allow me to contribute and make a meaningful impact even in a small way. The ability to further SAJA's mission by developing and advancing South Asian journalists (especially women) and amplifying their voice using this platform is of particular interest to me. I'd want to learn more about SAJA, in particular current challenges/problems/gaps, to help inform what the next act is for SAJA and how that then translates into a specific vision and set of priorities. I would want a key focus and priority to be the development and advancement of south asian female journalists and more visible role models (gender/minority diversity gap and opportunity not just in journalism but almost every field). A forum to connect and develop female journalists. I have been affiliated with SAJA for nearly seven years. I feel there is not enough presence of Pakistani journalists in SAJA as well as on SAJA Board. I would like to run for SAJA Board to make sure that the SAJA Board is more diverse and representative of all South Asia countries. I am an exiled journalist from Pakistan's troubled southwestern province of Balochistan which gives me unique perspectives and knowledge about challenges of press freedom, attacks on the media and journalists at risk. I can help SAJA develop resources for journalists at risk in different South Asian countries. I would like to see SAJA become more assertive about safety issues journalists face in South Asia and provide resources, such as SAJA' s reporting fellowships, to highlight the hardships journalists face in South Asia. I would also like SAJA to award the courageous work of journalists who risk their lives in South Asia to report untold stories. I would like to make sure that SAJA remains proactive and people's go-to resource in Washington D.C. SAJA can grow as a big organization in Washington DC, where I live and work, if we devote more time and energy and organize events and workshops. I can help achieve this goal given my own involvement in numerous organizations for which I regularly organize events, podcasts and workshops in the nation's capital. SAJA has helped me connect with a network of amazing South Asian journalists (and non-journalists) working in North America. It is unfortunate that one does not see many South Asians on television screens or front pages of newspapers but it does not mean that many South Asian journalists are not doing exceptional work. SAJA provides us all that platform to recognize these people's great work and also helps us all connect and network with each other. I'd like to get more involved in encouraging diversity, mentorship and reporting issues specific to the South Asian diaspora. I would like to be part of shaping journalism in South Asia as the region takes a real foothold in the global, scientific and service industries. I think SAJA has done an impeccable job of hosting events, workshops, newsroom tours and managing scholarships, not to mention the annual journalism awards and dinner. I'd like to keep these things going and also represent the group at other organizations such as ONA, AAJA etc. so that we can not only collaborate but pique interest of those who need help reporting in South Asia. SAJA has been a lucky break for me. Within a month of membership, I got a fellowship to Atlanta. Then, I got a mentor. And most recently, I was able to secure my first filmmaking position through a post on SAJA. It's been a greta resource and I'd like to keep the momentum going for others. I think SAJA will think about victim journalists from South Asia. Support those journalists who are passing their life under fear. I think SAJA is a south Asian Journalist Platform. As a Member of this organization I feel myself very strength . I never feel I am alone in this country. What is one event or activity you would like SAJA to implement?